The summer is an amazing time to improve ourselves, while also taking a much needed rest from schoolwork. In this light, I wanted to share some ideas from Sonny Rollins that shed light on the ever-evolving nature of getting better and improving ourselves. Sonny Rollins is a tenor saxophonist whose career has spanned over 60 years. Rollins is said to be one of the most influential jazz musicians of all time. His unique sound, immense discography and original compositions have led him to receive numerous honors such as the Grammy Lifetime Achievement Award and the Kennedy Center Honors. 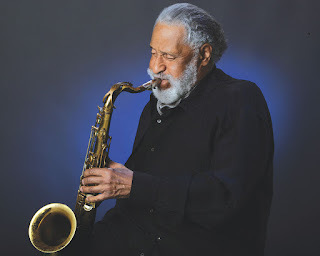 To learn more about Sonny Rollins, visit his website and NPR's resources. Rollins has a very unique outlook on playing, as well as life in general. In the following video he talks about how to get better. What is impressive is his large focus on patience - and it is important to realize that such an influential figure built himself on this kind of patient, slow, thoughtful work. You gotta do some things. You have to do some things. Playing long notes will help you to do a lot of other ideas, it will help you to get to a lot of your other ideas. So play the long note and you know when you play a long note, there's so much that you can put in there. It's slow...but everything is slow, you have to bring everything down to its basics. One note, just play one note and thinking about it, hearing it, hearing it up and down around, everything about the note, listen to it, feeling it. In this way, it is productive to put your focus and care into one note because without a basic foundation there's no feasible place to go musically. Yet, this applies to so many pursuits outside of music - no matter what you are passionate in, it is important to gain a solid background of fundamentals. Just think that you have an instrument that can only play one note - then what are you gonna do? So that's your instrument. Play that one note like that's the only note on your instrument. If you look at it that way, because in essence that's true. And if you do that then it's one way that you're going to improve yourself in a technical way and also in a musical, spiritual way because every note that you play has a great meaning. And this is the way you have to look at music, everything, and in life, everything has a meaning. This concept sheds light on the idea that improving yourself technically improves yourself spiritually, and vice versa. In fact, this idea of zen, and doing one thing at a time, benefits us in any daily pursuit from schoolwork, to sports, to interacting with others. It is amazingly simple to play one note, yet even with simplicity comes the complexity of mastery. I hope this summer we can all take a step back and work with this same focus, intensity, and urgency Sonny Rollins mentions in his speech.